Ownership / Access: Private holiday home, inaccessible to the public. 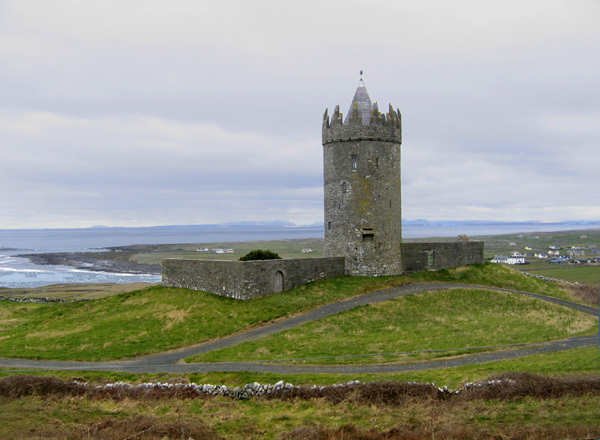 Notes: Doonagore Castle is a round 16th-century tower house with a small walled enclosure located about 1 km above the coastal village of Doolin in County Clare, Ireland. Its name may mean "the fort of the rounded hills" or the "fort of the goats"; it sits on a hill overlooking Doolin Point and, along with a nearby higher radio mast, is used as a navigational point by boats approaching Doolin Pier. Doonagore Castle is at present a private holiday home, inaccessible to the public. While a castle was built on the site by Tadgh MacTurlough MacCon O'Connor from stone drawn from the quarry of Tra Leachain some time during the 14th century, the current structure is likely to date to the 16th century. In 1580, it was owned by Sir Donald O'Brien but it soon fell to the MacClancys (or Clancys). In September 1588, a ship of the Spanish Armada was wrecked below the castle. 170 survivors were caught by the High Sheriff of Clare, Boetius Clancy, hanged at Doonagore Castle and buried in a barrow near Doolin called Cnocan an Crochaire. Doonagore Castle was repaired in the early 19th century, but by the middle of that century had again deteriorated in the care of the Nagle family. It was restored in the 1970s by architect Percy Leclerc for a private purchaser, an Irish-American named John C. Gorman whose family still owns it.